It’s the Errol Arendz, Du Sud Warehouse Sale! Home » It’s the Errol Arendz, Du Sud Warehouse Sale! Get Ready For the Epic Errol Arendz, Du Sud Sale! 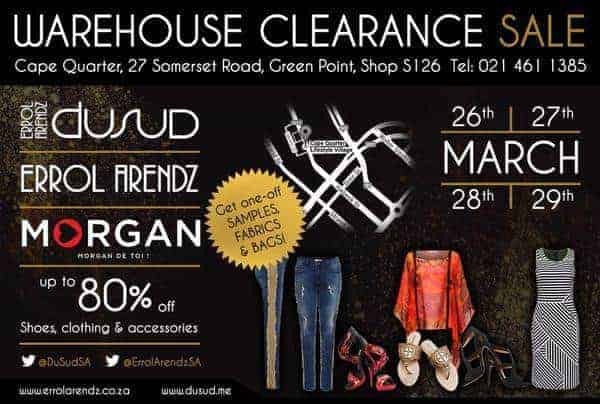 The Errol Arendz, Du Sud and Morgan Warehouse Clearance Sale is happening from the 26th to the 29th of March. We’ve got a R500 voucher to giveaway to one lucky reader and it’s so simple to enter! Just follow us, then tweet us (@CapeTownInsider @DuSudSA, @ErrolArendzSA, @capequart) and let us know why that voucher just HAS to be yours! designer heels, boots or flats.